We think Ellen’s is the Best Ice Cream Ever and we like making people happy by serving it to them! Ellen’s Homemade Ice Cream opened in September 1997, bringing delicious homemade ice cream to downtown Charleston, WV. All of the ice creams, sherbets, gelatos, and sorbets are made on the premises. Ellen’s also offers coffee, tea, and espresso as well as lunch options such as homemade soups, green salads, pasta/grain salads, wraps, and more. The menu includes many vegetarian and vegan options. Ellen’s offers customers many traditional treats such as Banana Splits, Hot Fudge Sundaes made with our own homemade hot fudge, Brownie Sundaes made with our homemade brownies, as well as other ice cream treats. 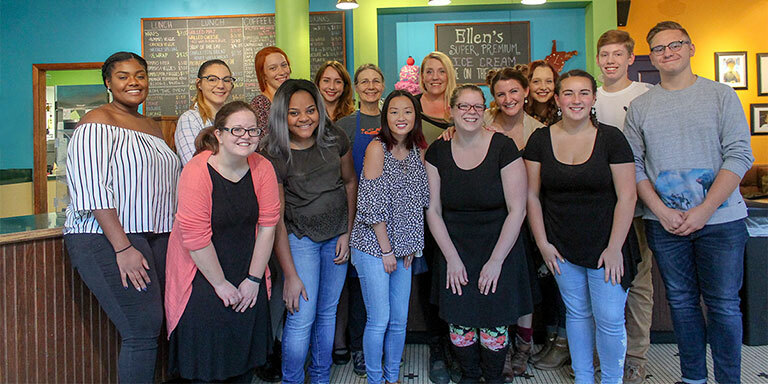 Ellen’s also offers unique treats that combine our incredible espresso with our fantastic ice cream to make delights such as Cappuccino Milkshakes, Espresso Sundaes, and Down Under Iced Coffee. At Ellen’s, customers may have a healthy and delicious lunch accompanied by tea, coffee or cappuccino and dessert that could include homemade cookies, brownies, carrot cake cupcake, or a wonderful ice cream treat. It is the goal of Ellen and her staff to provide a welcoming and happy atmosphere to all customers.